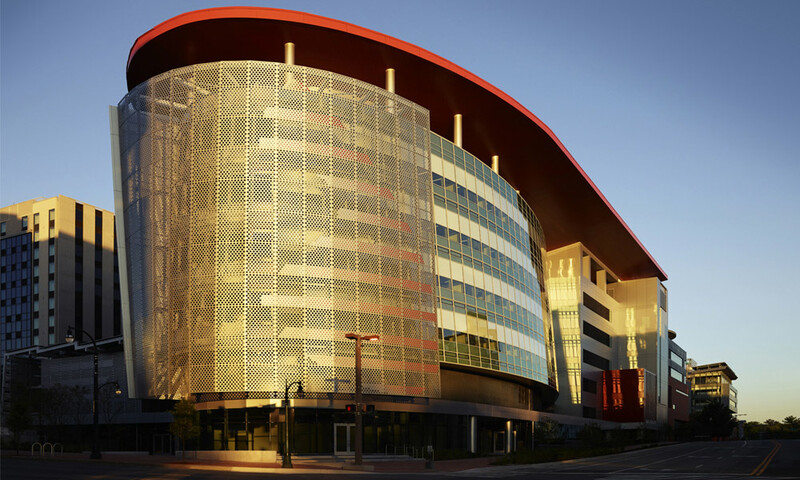 EwingCole is pleased to announce that opening ceremonies for the six-story expansion of United Therapeutics’ downtown campus took place on Friday, September 21st. The 210,000 square-foot, elliptical shaped “Unisphere,” is the largest site Net Zero commercial building in the US and houses clinical operations for pulmonary disease, heart failure, and organ transplantation as well as In Silico molecular biology – a virtual drug development lab. 3,000 solar or photovoltaic panels on the building generating 1,175 MWH of energy each year, enough to power 100 homes. The Earth Labyrinth is a quarter-mile-long concrete maze located twelve feet below Unisphere. This natural ventilation system, a collaboration between air and earth, moderates temperatures within the atrium as compared to the exterior climate. Beneath Unisphere, 52 closed-loop, dual-circuited geo-exchange wells are drilled 500 feet into the earth to provide energy storage. The atrium pool is used as a heat sink to help balance the overall system and provide passive heating of pool water. Daylight harvesting allows dimming of the artificial lighting system when adequate sunlight is available. The office area windows use electrochromic glass technology that changes tint level based on season, location of the sun, and cloud coverage. Operable windows and panels allow the building to naturally ventilate providing a completely passive ventilation mode between certain temperatures. Excess power is sent back into the utility grid during peak production times, and the utility grid supplies this power back at night and at off-peak times. The building team includes architect & engineer – EwingCole; contractor – Whiting-Turner; owners’ representatives – Stranix Associates. Led by chairman and CEO Dr. Martine Rothblatt, United Therapeutics is a biotechnology company focused on the development and commercialization of innovative products to address the unmet medical needs of patients with chronic and life-threatening conditions. One of Greater Washington’s largest bioscience firms, United Therapeutics now occupies 435,000 square feet of office and lab space in Silver Spring.